Here in the north, the leaf colors have really popped in the last week, and I have started making soups and baking with pumpkins and apples. But it's never too far past summer for homemade ice cream. So when I was assigned to Amy's blog, Savory Moments for October's Secret Recipe Club, I pinned several of her recipes, but finally settled on this one which seems to just scream all things fall. This ice cream is SO easy to put together. And the best part? It's extremely delicious. When I served it at a dinner party, one of the guests said, "this is the best ice cream I've ever eaten!" WOW. That's high praise. Thanks, Amy, for a great recipe. Find more great ideas at Inspiration Monday, Mix it Up. Whisk together all of the ingredients in a large measuring cup or batter bowl until well-combined and the sugar dissolves. Refrigerate for about two hours or until well chilled. Churn and freeze in an ice cream maker according to instructions. When at soft serve stage, transfer to a freezer container for four hours or overnight to harden. Remove from the freezer about 5-10 minutes before scooping. Makes about 12 servings. Hi Sara! I'm so glad you and your guests enjoyed this ice cream. Thanks for the kind words. 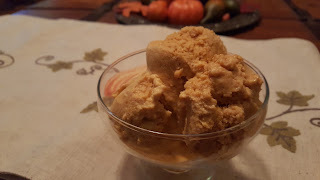 pumpkin + ice cream - yum! 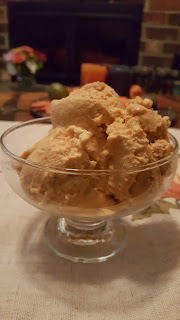 Pumpkin ice cream is a new idea for me. I wonder how that tastes. Ice cream is good ALL. Year. Round!! And this is the perfect fall cold treat! I LOVE no-churn ice cream and pumpkin is one of my favorite flavors. This is definitely going to be made in my kitchen soon! Great SRC choice! Love the color to this ice cream! The spices sound incredible. Ice cream is good any time of the year! I love that you chose to make a pumpkin version though, the perfect Fall dessert.